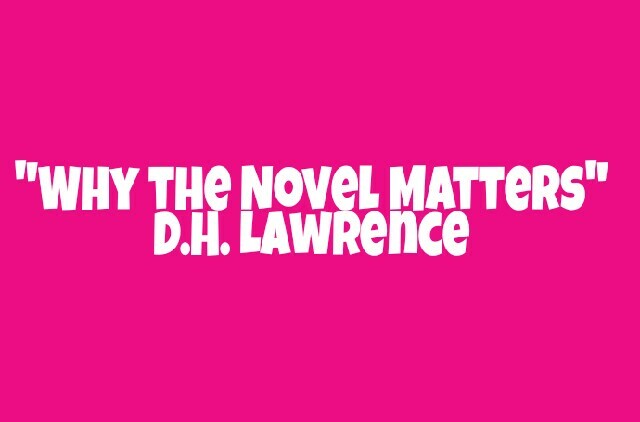 The essay Why the Novel Matters is D.H. Lawrence 's statement about his belief in the novel as a means of instructing or guiding man and women to live life to the fullest. It was published posthumously in 1936 in an essay collection titled Phoenix. 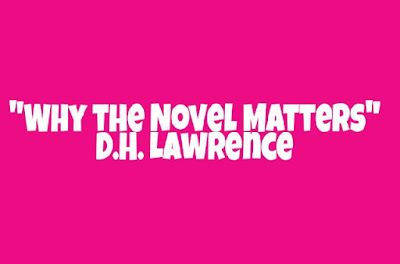 Lawrence wrote emphatically that he did not want to grow in only one direction. The word of the Lord according to him is an utterance of man and therefore fades away. However, nature on the other hand regenerates itself. The withered grass grows greener after rains and flower fades to return as the bud. Therefore, since grass renews its youth it is alive, it is not a mere word which was only a tremulation in ether and which ceased to exist. He said that 'once and for all' absolutes would have to be done away with because nothing is absolute: good or right. In the Novel, the characters can do nothing but live because if they live according to pattern good, bad or volatile without change, the novel falls dead. 'We likewise, in life have got to live, or we are nothing.' felt Lawrence. Men and women in today's world walk about dead, a carcass in street or house, like a piano with half its notes mute.